Where did that summer go? Wow. My last post was in June. Where has the time gone? I’d love to say I spent the summer traveling and was just never near my computer, but that wasn’t the case. Sadly, I think it was mostly work. Which is funny to say, coming from a freelancer. But now that the upstairs second bedroom is my office, if I’m not booked for a client, work is just a step away all the time. Working on a feature length documentary requires a slow and steady progress. I guess I did get away a few times, though. We had a great show at PEX Summer Fest, one of our best- for Thursday night anyway. We had some technical difficulties for the Friday night show but the overall reaction was amazing. This was the first year I actually had FUN at PEX, too! Camping with the Luxie ladies made a huge difference, and I ended up wrangled into helping in various ways- including being a safety for the conclave right before the burn. Wow, did I get some good practice putting out huge flaming props. Lets see, what else? We had one brief vacation, to Rehoboth beach. Good people, but terribly humid and hot weather. Lots of swimming. We also went to Boston, which was a lot of fun. We rented kayaks and hung out with Chris’ sister, and then drove all the way home. Long day. My sister came to visit from Seattle for quite a whirl-wind trip. Lux Arati had an on-going gig in Atlantic City over the summer that started out a little crazy, but turned out to be a ton of fun. I was rather anxious about going, not sure what I would do to entertain the crowd for 2 hours without fire (the venue found out that they needed to have a fire marshal on scene the whole time if we preformed with fire, which was out of the budget for the event). I bought some long veil fans, practiced with my sword and dug out my silk veil that I think I’d used once previously. It was awesome. 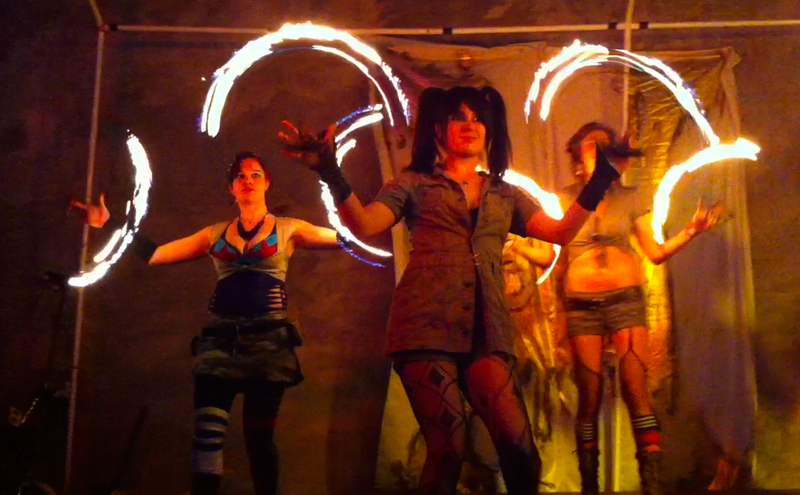 The gig included 3 dancers a night from 9 to 11 on every other Friday and Saturday night for about 6 weeks. We rotated the schedule, filling in around everyone’s availability. I think it was pretty well received. 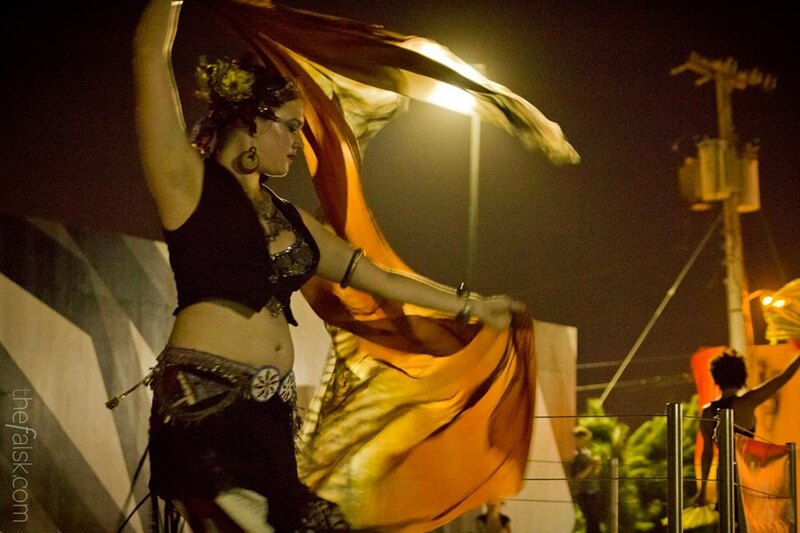 We had everything from glow hooping to feather fans and belly dance. Fun fun! And now? Fall is upon us. Everything moves along, working some days on location, some days at home, trying to practice with my sword and my fans and maybe even through the staff in there. Working on my cable-full sweater is progressing slowly, and I have another monster in the queue…. everything keeps going.